This study was conducted in order to investigate the enzymatic in vitro digestibility of nutrients and phytate degradability in full-fat soybean. Raw full-fat (FF) soybean, heated at a range of temperatures, was compared to unheated one and commercial SBM. The physicochemical properties, nutrient composition and the phytate contents were evaluated. Four seed samples of raw FF soybean were individually subjected to steam- or dry-heating for 15, 30, 45 or 60 min all at 95°C, and were then finely ground. The results revealed that crude protein (CP) and dry matter (DM) contents ranged from 418.6 to 462.9 g/kg and 919.1 to 968.7 g/kg, respectively. 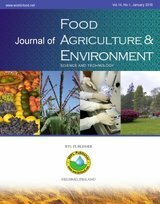 The fat content was on average higher (157.4 g/kg) in FF samples than in the commercial SBM (19.2 g/kg), hence, the calculated AME content of the FF samples was 13.1 MJ/kg compared to 9.0 MJ/kg for the commercial SBM. Starch (37.0 g/kg) and total sugars (107.6 g/kg) were highest in commercial SBM. Protein solubility (794.4 g/kg) and urease activity (0.09 ΔpH) were lower in commercial SBM than the average values of 893.4 g/kg and 2.1 ΔpH for FF samples, respectively. The concentration of trypsin inhibitors was highest in the sample of FF that was heated for 15 min (13098.0 TIU/g). The concentrations of amino acid (AA) were higher in commercial SBM than the average value in FF soybean. Samples incubated in an enzyme cocktail (phytase + protease) had higher in vitro digestibility of DM and CP values than others. The degradability of phytate in the samples that were incubated in the enzyme cocktail was higher (P<0.01) than that in the other media. The pellet durability index (PDI) of diets containing graded levels of raw soybean meal (RSBM) influenced (P<0.01) by pelleting conditions and inclusion rate of RSBM. The nutritive values of these samples would need to be evaluated in feeding trials.